Hi Everyone! 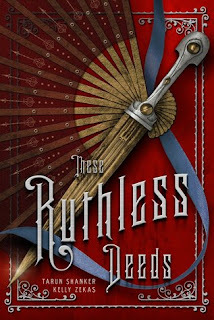 So as you can see, I am participating in Xpresso Blog Tour's tour for These Ruthless Deeds. They have supplied me with a copy of this book as well as a copy of These Vicious Masks in order to provide an honest review. Please note that this has not affected my opinion in any way. Unfortunately, this giveaway only applies for residents who live in the US and Canada. So if you are America or Canadian, be sure to enter using the link! I WARN YOU ONCE MORE THAT THIS IS THE SECOND BOOK IN A SERIES. PLEASE BE AWARE THAT THIS REVIEW MAY CONTAIN SPOILERS FOR THE FRIST BOOK. I loved the previous book! I thought it was incredibly great. However I didn't start this one directly afterwards because I pretty much marathoner the previous book and needed time for the information to settle. Nonetheless, I am pretty excited to see how the story progresses from that weird and sad cliffhanger. Thank you to Xpresso Book Tours for providing me with a copy of both of the books. Please note that in no way has receiving this book affected my opinion. All thoughts are my own. Personally, I don't think that there was much of an improvement/development in terms of the authors' writing style. The one thing that I did notice is that the authors started to use bigger/fancier words and they stuck to the language used in the 1800's more than what they did in the first book. This book started off with a bang. I absolutely loved it. The book is started off with a different perspective and although it is supposed to be a mystery, I suspected from the moment that I read it who's perspective it was. Another thing that was really great was that we finally got to meet the Society of Aberrations. In the pervious book, they are mentioned once and then never again. But in this book we actually meet the Society and quite early on which was really interesting. I found that this book started a lot quicker than the first book and I think that is mainly because we already know of the secret world that lies beneath the mundane world. I was actually (surprisingly) annoyed with the love triangle introduced in the first book. I was hoping that I would have been resolved by the end of the first book but unfortunately it wasn't. I love the characters in this book. There is simply no doubt about it. I love how witty and stubborn Evelyn is and how crazy and brave Mr. Kent is. And Sebastian... Our local brooding, full of dark mysteries love interest. I love them all. Even the new characters that we meet in this book. They all felt realistic and accessible! Overall, I loved this series. I knew I would enjoy it, I just didn't know if I would love it. 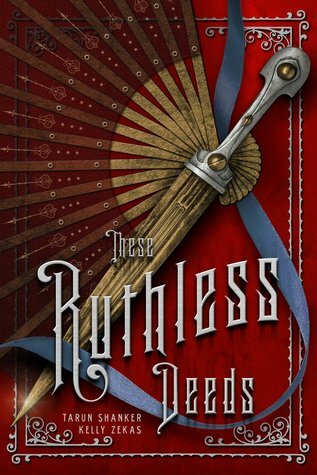 I can't wait for the next book (because apparently this is not a duology as originally suspected by everyone else). I can't wait to see how the story continues to progress in the next book. I love all of these characters and you can expect to see a lot of fan art in my photo gallery and hopefully, eventually, on my shelf as well! Please do pick this book/series up! It is definitely something for everyone! 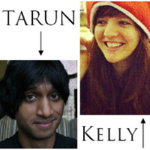 Tarun is a write living in Los Angeles whose idea of paradise consists of kung-fu movies, David Bowie and chai tea. Since completing his first horrible screenplay in high school, he's written everything from one-act plays and film cidicim to humor pieces and strongly worded emails. He's also magnetized, crude and burned the hard drive where that first screenplay can be found. Kelly is a writer and actor living in NYC. YA is her absolute favorite thing on earth other than cupcakes and she has spent many hours crying over fictional deaths. She also started reading Harlequin romances at a possible too early age (12? ), and still loves a good paperback romance.